The sheet metal has the characteristics of lightweight, high strength, conductive (can be used for electromagnetic shielding), low cost, large mass production and so on. It is widely used in the fields of electronic appliances, communication, automobile industry, medical equipment and so on. For computer chassis, mobile phone, MP3, sheet metal is an indispensable part. 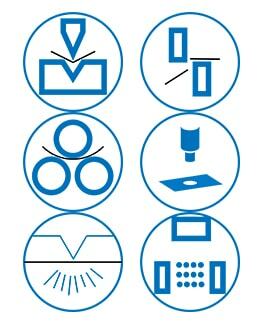 With more and more widespread application of sheet metal, sheet metal design has become a very important part of the product development process, mechanical engineers must master the design of sheet metal design techniques, make the design of the sheet metal not only meet the product function and appearance requirements but also make stamping die to manufacture simple, low cost. The traditional sheet metal cutting equipment in the market occupies a considerable market share, in addition to their well-known reasons, the main price is cheap. 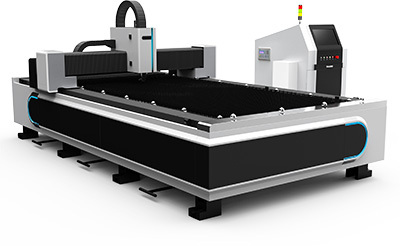 Although the disadvantage is very obvious if compare with the laser cutting technology, they also have their own unique advantages. 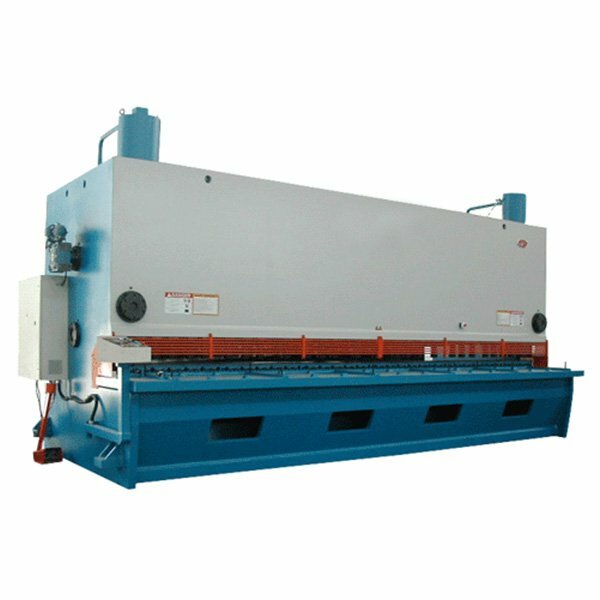 Since the CNC shearing machine is mainly used for straight cut, although the shears can cut up to 4 meters of the plate, it can only be used for straight line cutting in sheet metal fabrication industry. Generally used in those industries which only need straight line cutting after straightener. 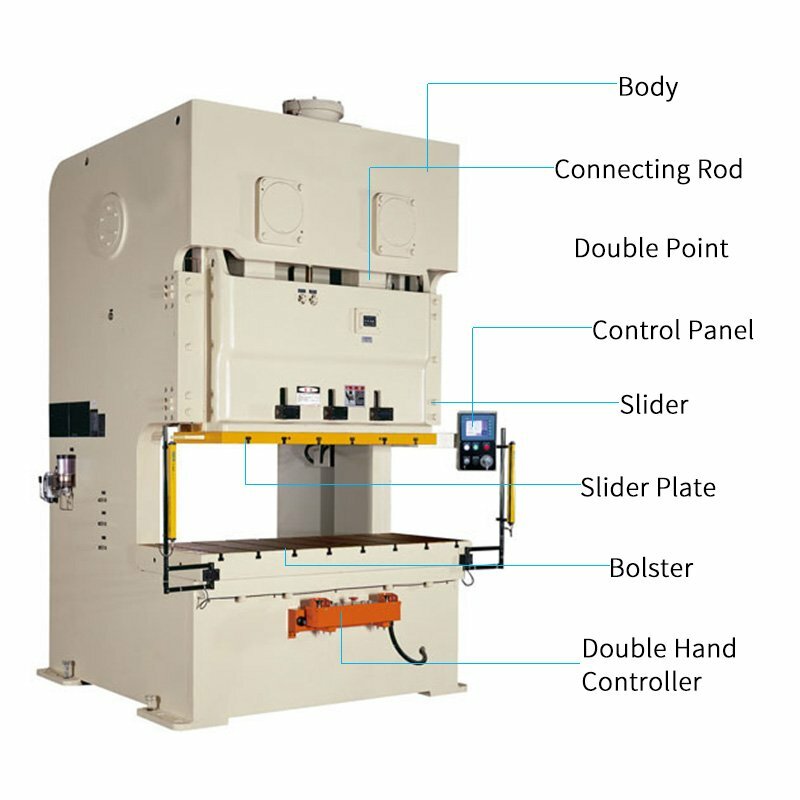 Punch press machine has more flexibility in the curve processing, a punch can have one or more sets of the round or other special required punch molds, can be used to make a number of specific sheet metal parts with one punch. The most common are the chassis cabinet industry, it mainly requires a straight, square hole, round hole cutting, the pattern is relatively simple and fixed. The advantage is the fast sheet processing speed for simple graphics, the shortcoming is limited capacity for thick steel plate punch. Even if it can be used for punching thick plate, the surface of the workpiece will collapse, waste of mold. The mold development cycle is long, with high cost, flexibility is not high enough. In abroad, for the plate thicker than 2mm, modern laser cutting technology will be adopted for plate cutting, rather than the use of presses. One reason is that the surface quality is not good, the second reason is that much larger ton of punch will be needed for thick plate punching. This is a waste of resources, the third reason is that there has too many noises when punch thick plate, not conducive to environmental protection. Flame cutting as the initial traditional way of cutting mainly because of its low investment and low requirement for the fabrication quality. If it is in high requirements, the problem can be solved when coupled with a machining process, the market is very large. Now it is mainly used to cut steel plate with the thickness larger than 40mm. The disadvantage is that it has too large heat deformation, too wide cutting slot, waste materials, and then processing speed is too slow, only suitable for rough fabrication. 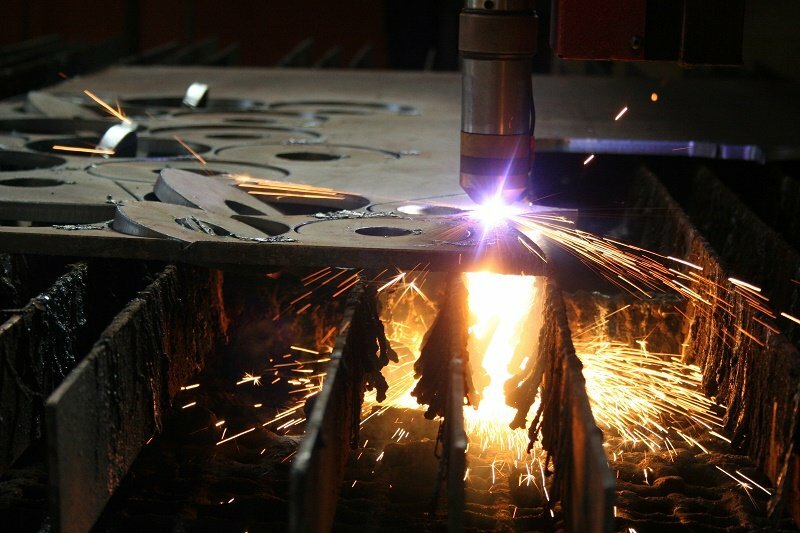 Plasma cutting and fine plasma cutting is similar to flame cutting, the heat affected area is too large, however, the accuracy is much better than the flame cutting, the speed of cutting also improved a lot, which makes the plasma cutting became the main force in the middle plate processing. The actual cutting accuracy of the top edge CNC precision plasma cutting machine has reached the lower limit of laser cutting, the cutting speed has exceeded 2m/min when cutting 22mm carbon steel plate, and with the smooth cutting surface, the best slope can be controlled within 1.5 degrees. The disadvantage is that there is too much thermal deformation in the cutting of thin steel plate, the slope is also large, cannot meet the requirement for accuracy. The consumptions are very expensive. 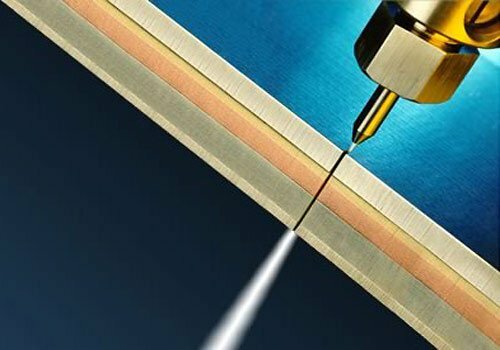 High-pressure water cutting is the use of high-speed water jet doping in the implementation of the diamond to finish sheet cutting, it has almost no restrictions on the materials, and the cutting thickness can reach 100mm or more. 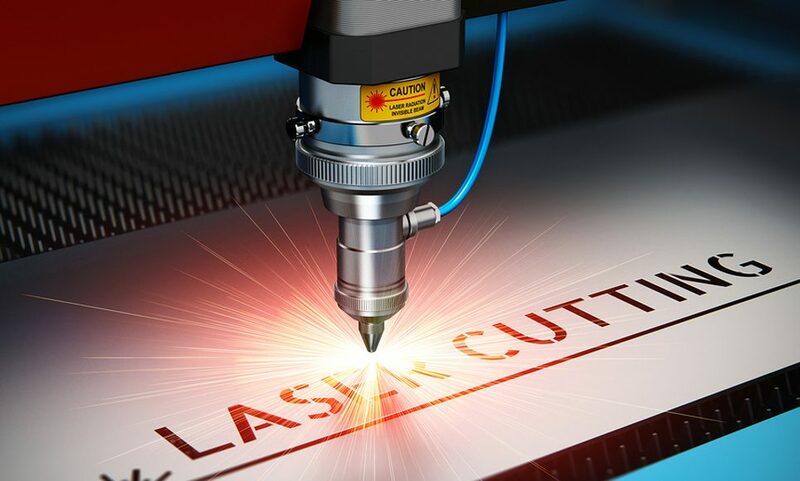 It can be used to cut materials which are easy to burst, such as the ceramic, glass, it can also be used to cut high-reflective material on the laser, like copper, aluminum, however, there is a big obstacle for laser cutting. The shortcomings of water cutting are the processing speed is too slow, too dirty, not environmentally friendly, consumables are higher. 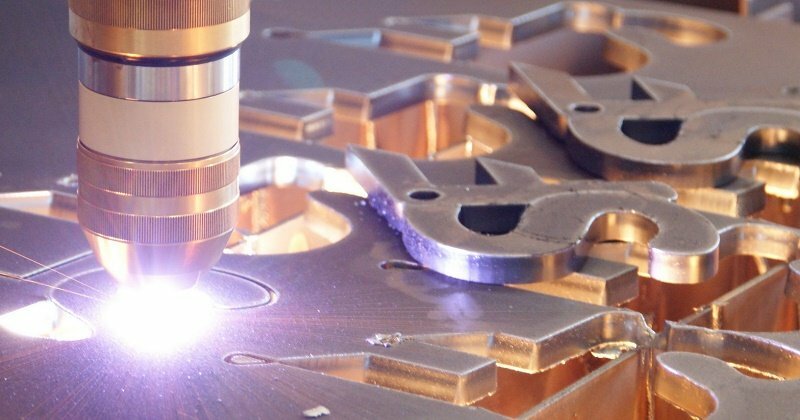 Laser cutting is one technology revolution for sheet metal processing, is the “processing center” for sheet metal fabrication. Laser cutting has a high degree of flexibility, fast cutting speed, high production efficiency, short product production cycle, in a wide range of markets for customers. Laser cutting without cutting force, no deformation of the processing; no tool wear, good material adaptability; whether it is simple or complex parts, can realize precision fast forming cutting with laser cutter; Besides, it has narrow cutting slot, good cutting quality, high degree of automation, simple operation, low labor intensity, no pollution; can achieve automatic cutting nesting, nesting materials, improve the utilization of materials, low production costs, good economic returns. The effective life of the technology is very long, currently, in abroad factories, the plate exceeds 2mm mostly adopt laser cutting. Many foreign experts agree that the next 30-40 years is the golden age of laser processing technology development, which is also the development direction of sheet metal processing. This was a really interesting read and I did not know that there were so many metal cutting techniques out there. Although I can definitely see why many of these are more efficient than a blade or saw. Laser cutting in particular seems great because it can cut a lot of things precisely over and over again. Laser Cutting is a good way of cutting. It has flexibility , efficiency and high speed of cutting, it take less time than other machines. Wow, I would have never guessed that laser cutting had so many advantages over other options, but you do raise some good points. I am especially interested in the fact that laser cutting can be so flexible. After all, if the laser’s cutting power is based on heat I suppose that that could be adjusted to cut through any kind of metal you might need. I never knew that laser cutting is so flexible or precise! If that’s the case, my husband should look into getting his sheet metal from companies that use laser cutting so that everything is exactly as he wants it for his project. He told me the other day that everything needs to be measured exactly so that the final product will turn out, so laser cutting sounds perfect for him. Yes, laser cutting is in very high accuracy. It’s good to know that laser cutting is such a revolution for sheet metal processing, as you said. My husband’s workplace may start hiring laser cutting services for some of their metal processing soon. The fact that it’s so fast and flexible, as you said, makes it sound like a great option for the company, for sure.